Upcoming four-story, 375,000 square foot research, development, and manufacturing facility located on the east end of Boston's booming Seaport District. The first phase of Innovation Square will be a four-story, 125,000-square-foot building opening by the first quarter of 2019, anchored by a two-floor, 54,000-square-foot office for Mass Innovation Labs. The developers of Innovation Square at 6 Tide Street in Boston's Seaport District have filed a notice of project change for the project. The proposed changes would add 10,000 square feet of local retail, restaurant, and services space along Northern Avenue, as well as 45 parking spaces. Interior work is underway at phase one and the control system is being installed for the first building in the Seaport's Innovation Square development. The first building comprises 125,000 square feet and will be home to the Mass. Innovation Labs. Construction on phase one is set to be complete in the first quarter of 2019. Phase Two of the project will add another 250,000 square foot building of cutting-edge lab space to the project. Innovation Square will also offer bike storage, on-campus fitness, a collaboration center, on-site restaurants, and private roof decks overlooking Boston Harbor. A groundbreaking ceremony was held Wednesday for the $50 million, 125,000-square-foot first phase of Innovation Square in the Seaport District, which will be anchored by a new two-floor, 54,000-square-foot office for Mass Innovation Labs. The groundbreaking of the four-story building follows Mass Innovation Labs’ announcement earlier this week that it will lease 84,000 square feet at The Auerbach Center, a 160,000-square-foot mixed-use building coming to the 15-acre Boston Landing development in Brighton, opening June 2018. Mass Innovation Labs also announced earlier this month it will lease 52,000 square feet at 21 Erie Street in Cambridge. 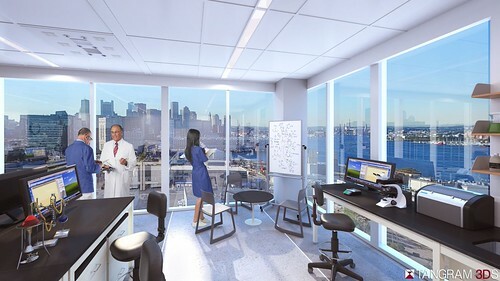 Mass Innovation Labs will open its’ Seaport office by the first quarter of 2019. “Mass Innovation Labs is the perfect tenant to kickoff [Innovation Square],” said Stephen Faber, President of Innovation Square co-developer Related Beal, in a prepared statement. “They nurture innovative, entrepreneurial, high growth organizations with the potential to create a substantial economic engine for Boston and the commonwealth.” Cushman & Wakefield represented Mass Innovation Labs in the lease, and JLL represented Related Beal and Innovation Square development partner Kavanagh Advisory Group. Upon full buildout, Innovation Square will feature 360,000 square feet of lab space. East Boston Savings Bank provided nearly $51.5 million in construction financing for the development’s first phase. Additional space at Innovation Square is now available for lease. Per the Boston Redevelopment Authority (BRA) website, the approved Innovation Square industrial project in the Seaport District is moving forward. As of this past Tuesday, June 14th, 2016, the project's official phase is listed as Under Construction. The project has been in the works since November 2012, when developer Kavanagh Advisory Group was designated as the site's tentative developer. The project was approved for construction in December 2013. This page will be updated with further details as they become available. More information about the approved Innovation Square project is posted below.